You are undoubtedly familiar with the saying ‘to stand still is moving backward’. If there is something which is not standing still, it is the technological development and the related industrial development. We are currently at the beginning of the fourth industrial revolution, also called ‘SMART Industry’, or ‘Industry 4.0’, as this revolution is called in Germany. The classical value strategy Product Leadership, Operational Excellence, and Customer Intimacy melt together to one common value strategy. Product Life Cycles are getting shorter and products becoming more customer-specific. Companies will need to adjust their processes for product development, production, and services to this development. 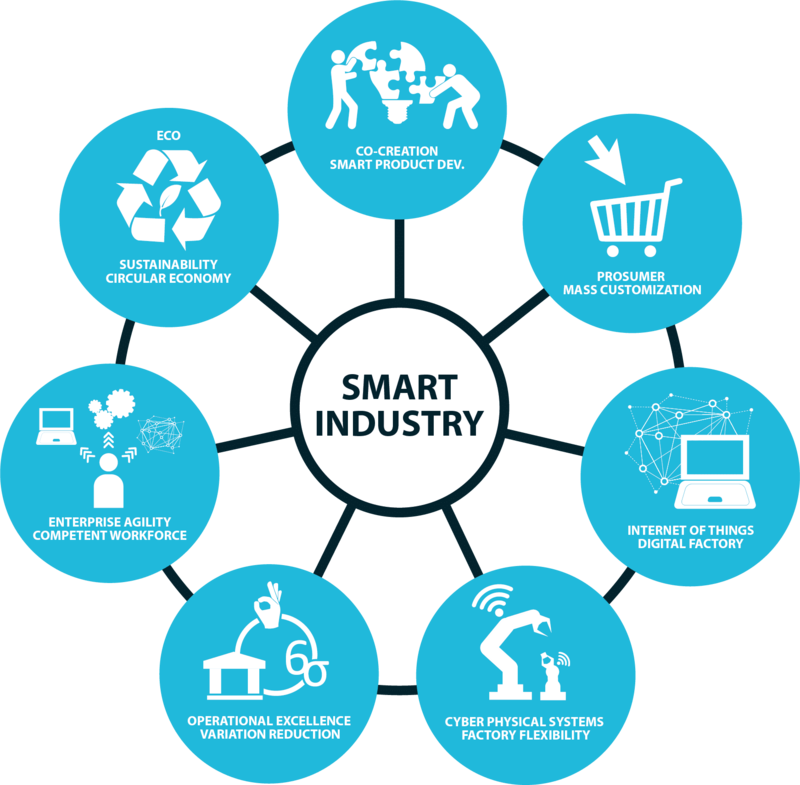 The SMART Industry Framework, as described below, is developed by SMART Industry Network (smartindustrynetwork.nl). In the development trajectory of new products, the design process and the production process will take place in parallel and no longer sequentially. The digital design of a new product will develop simultaneously with the production of the physical product. Co-creation will also become increasingly important through collaborations. Consumers change to ‘prosumers’. By linking the internet and production in SMART Factories, the Prosumer can directly influence the production process. Orders from Prosumers are processed directly in the design process and production planning. Machines, goods, and parts communicate among themselves about planning, processing and supplies that are required. The exponential development of ‘Big Data’ generates such a large quantity of operational information that people can no longer comprehend. Attention is therefore shifting to Data analytics, including algorithms that allow machines to make autonomous decisions. The factory of the future consists of intelligent self-learning robots. These so-called ‘Cyber Physical Systems’ are Lego bricks that all fit together and communicate with each other. Machines are ‘customers’ themselves and call for raw materials and maintenance when necessary. The factory of the future offers maximal flexibility. Each product is uniquely identified so that it is clear at each processing location what adjustments the product has to undergo. Different types of products are on the same production line and can undergo different processes. Organisations will need to perform at the highest level of Operational Excellence and be continuously working on improving processes. The application of Lean, data analytics and Six Sigma contribute to reducing variation and augment the process capability and predictable maintenance. This contributes to preventing unplanned standing still and zero defect. In order to be successful in the future too, the speed at which the organization can adapt is crucial. Organisations need to become more agile. The adaptability is not only dependant on technological innovation, but mainly on the adaptability of the employees. To keep up with the pace of change, employees will have to keep developing themselves constantly. Sustainable production within SMART Industry means that products during the production process, the use phase and in the waste phase to not damage the living environment. In both the design phase and in production, elements such as CO2-neutral and 100% reusability must be taken into account. The application of new technologies such as 3D printers, but also new raw materials and materials such as Nanotechnology offer new opportunities. SMART Industry offers Dutch companies many new opportunities. The Netherlands is innovative, has a high-quality industry and has a unique position in Europe in terms of logistics. As a result, the Netherlands has a good starting position to lead the way in the new Industrial revolution SMART Industry.